As anticipation rises for a powerful El Niño this winter, Los Angeles County officials said Tuesday they are gearing up to manage emergency responses to potentially strong rainstorms that could bring dangerous flash flooding and mud and debris slides. County Supervisors Hilda Solis and Michael Antonovich said it is critical that the county assesses its risks and vulnerabilities. The board directed multiple county departments to report back in 30 days on emergency response plans, flood-control capacity and plans to capture and store stormwater. The most recent forecasts show El Niño reaching the "very strong" category, and likely to persist through the winter months when the most rain and snow is likely to fall. The odds of El Niño continuing through winter are now put at 90 percent, with an 85 percent likelihood it will continue until early spring. Scientists are warning that this El Niño could be even stronger than 1997, when storms caused more than a half-billion dollars in damage and led to 17 deaths. 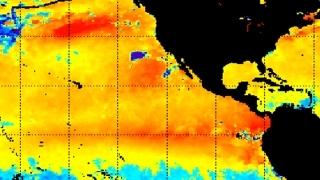 Experts have said, however, that even a massive El Niño will not solve the state's drought. The drought has already contributed to a busy wildfire season, which will exacerbate debris flows when storms come. Strong El Niño conditions are associated with wetter winters in Southern California and across the southern tier of the United States, while other areas in the states, Central America, and the western Pacific receive less precipitation.